Oh eye creams. The eternal quest for something that hydrates, smooths, brightens and generally gives one the skin of babies. 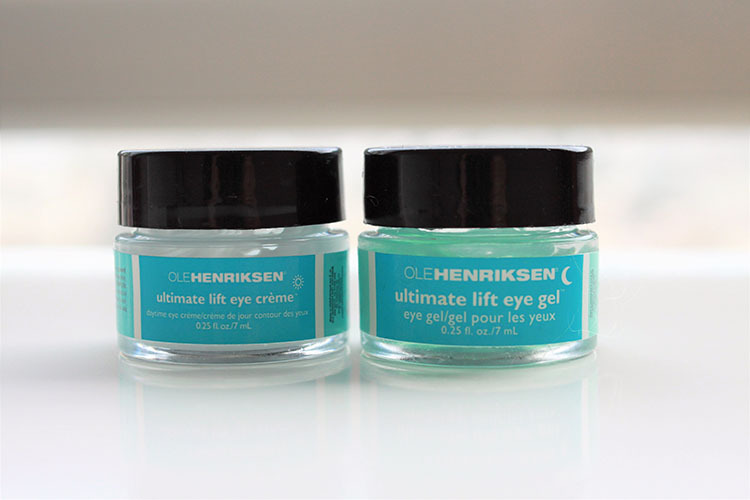 In the latest installment of my eye cream journey, I try out the Ole Henriksen Ultimate Lift Eye Cream and Eye Gel. Started by the brand's namesake, this Scandinavian brand first began in 1984 and is known for giving fans that signature "Ole glow" due to their use of natural extracts in skincare products and in treatments at their LA spa. The Ultimate Lift eye creams are formulated to provide an instant lifting effect to tired eyes. Perfect for maturer eyes, the daytime cream and night-time gel are designed to smooth out wrinkles, eliminate puffiness and firm the skin for a more youthful appearance. What it is: a lightweight day eye cream focused on providing a hydrated base for makeup and providing all day moisture and a refreshed appearance. So far so good with the ingredients! I really love how this cream contains a skin firming ingredient right at the top of the list. Besides the above, this cream also contains healthy amounts of aloe vera, grape seed oils, vitamin E and hyaluronic acid, all of which are great moisturizers. Oat kernel extract also helps improve skin's firmness, while cucumber extract cools and reduces inflammation. My take: This is a pretty basic, lightweight eye cream, but it does the trick. Upon application, my eye area does feel instantly cooled and refreshed and even at the end of the day, my under-eye feels noticeably smoother and softer. In terms of dryness and fine lines though, I didn't notice much of a change and my eyes still had slight fine lines under them when wearing concealer. For $52 this eye cream is definitely on the high end and for some odd reason, the same price as the Ultimate Lift Eye Gel, but at half the size. While I did achieve nice results with this cream, the price really makes me hesitate at recommending it as it wasn't mind-blowing enough for me to consider repurchasing it. What it is: A refreshing evening eye treatment with a unique thick gel texture. This eye gel contains a combination of hyaluronic acid and bio-peptides to combat puffiness and fine lines while you sleep. The Ultimate Lift Eye Gel is also vegan and cruelty-free! Unlike the day cream, the primary ingredients in the Ultimate Lift Eye Gel aren't quite as impressive, but this gel does also contain calendula flower extract, aloe vera and cucumber extract, all of which help condition skin and reduce inflammation. My take: I thought the eye gel was pretty neat as I'd never tried an eye cream with that type of texture. It's pretty fun to poke your finger into this little jar as the gel is quite squishy; unfortunately it's soo squishy that it can be a little tricky to scoop out the right amount of product to apply. Also, depending on what other moisturizers you use, this gel does tend to ball a bit. On the plus side though, it feels quite cooling, which can feel nice at the end of a long day. In terms of moisture, I'd say this eye gel is fairly light. After using this one for more than a month I don't think I've noticed much gains in moisture levels. My eyes aren't usually puffy so I can't report much on that and it didn't have much effect on my dark circles. However, if you did find this gel to work for you, it's a great deal as most eye creams come only in 15 ml sizes and this one is huge at 30 ml! Overall, my first experience with Ole Henriksen was "meh." Out of the two I think the Ultimate Lift Eye Cream was more worth it, although I found the format of the Ultimate Lift Eye Gel to be funner with its squishy texture, but I'm not paying $52 just to poke some jelly!